You are sweating trying to find your way and an ‘Are we there yet?’ hits you from the backseat of your car. Frustrating, isn’t it? Let’s be realistic, traveling by car isn’t the best option, especially in a crowded town like Barcelona. And let’s not forget about the struggle finding a parking spot and paying attention to every single person trying to cross the street. In the end, you will have missed all the elegance that Barcelona got. Besides getting a private accordion show, same thing goes with the metro. 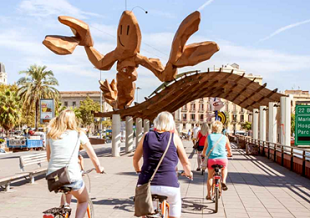 There are many ways to explore Barcelona as a family, but if you want to keep it amusing we recommend you to do it by bike. This way, everyone will be entertained. We wish you a lovely stay at our hotels for family in Barcelona!